Congenital hyperinsulinism is a serious yet poorly understood condition. Research funded by the Swiss National Science Foundation has discovered how it is caused by a genetic mutation. Diabetes is characterised by a deficiency of insulin. The opposite is the case in congenital hyperinsulinism: patients produce the hormone too frequently and in excessive quantities, even if they haven't eaten any carbohydrates. Hyperinsulinism is linked to the GDH protein. 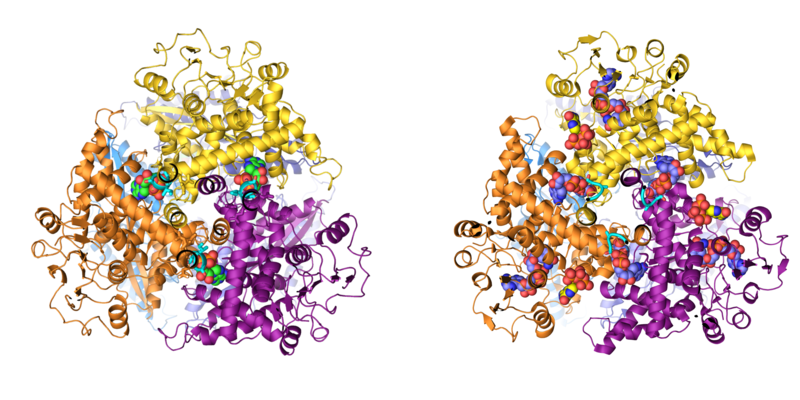 When open (at left), the protein can more easily attach itself to a molecule that is necessary for its activity than when it is closed (at right): this sends a signal instructing the pancreas to produce insulin. A mutation of the GDH protein disrupts this mechanism and keeps the protein open, which in turn leads to insulin overproduction. Since the function of insulin is to metabolise sugars, excess production of insulin leads to chronic hypoglycaemia. The brain, which devours vast quantities of energy, is perpetually undernourished. The disorder can therefore lead to serious brain damage and even death in the worst cases. People with this mutation also develop a surplus of ammonia - known as hyperammonaemia – which can equally have serious repercussions on brain function. This work, which was carried out by the PhD student Mariagrazia Grimaldi, showed that the cause of this problem is exactly the same: the mutant version of the GDH protein, which is always receptive to its accelerator, also causes excess production of ammonia in the liver. This new study could pave the way for new treatments. "We can imagine developing a drug that inhibits the GDH accelerator by occupying the same site, which would reduce the production of insulin," Pierre Maechler says. A drug of this type might also be used to treat obesity: if there is no insulin in the body, the person does not gain weight. The researcher points out that "the protein GDH could enable the production of insulin to be regulated. This type of approach, while appearing to offer an extremely simple solution, would of course raise questions and ethical problems. But we know that in some cases diets don't work, and gastric bypass surgery is by no means a harmless solution either." http://p3.snf.ch/Project-166625 Projet "Glutamate pathways and metabolic stresses in energy homeostasis"